New Delhi: Mindmine Institute, an independent think tank set up by Hero Enterprise and one of India’s premium training and consulting organization, announced the 12th edition of BML Munjal 2017 Awards for Excellence in Business through Learning and Development. The Awards were presented on the first day of the on-going Mindmine Summit 2017 on “Disruption: The New Normal for India?” Shri Prakash Javadekar, Hon’ble Union Minister of Human Resource Development gave away the awards to winners selected by an independent jury, which included some of India’s most respected names in the corporate sector. The Runners-up across categories include Lemon Tree Hotels, CONCOR, Dabur, Mazagon Dock, Logi Next Solutions and Indian Oil Corporation. The Awards were presented on day 1 of the 11th Mindmine Summit, one of India’s most influential Think Tank platforms organized by the Mindmine Institute. At this two-day forum from 20-21 April, diverse panellists assess the evolving political, business and societal landscape post disruption through a mix of interactive panel dialogues, one-on-one exchanges and debates. The awards are named after the late Hero Group Chairman and Padma Bhushan Awardee Dr. Brijmohan Lal Munjal. 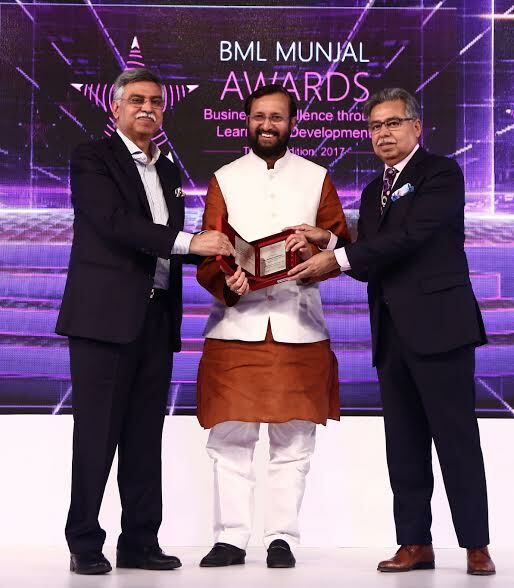 The annual BML Munjal Awards recognize organizations that have successfully deployed programs and implemented innovative strategies, processes and systems for learning and development, using people development as a tool to achieve Business Excellence. Past winners of the Awards include organizations such as Maruti Suzuki, TCS, BHEL Tata Steel, National Insurance, Bank of Baroda, HSBC, Infosys, HP, Indian Oil, PNB, among others.